Human ancestors used tools earlier than previously thought? Technology is one of humanity’s greatest strengths. With tools (and the brain to use them) we’ve carved out our own niche and constructed a pedestal on which to stand above the rest of the animal kingdom. Whilst other animals also use technology, none can boast any tool which matches the complexity of Homo sapiens‘ creations. There was no great leap for chimpkind. Since such great achievements were built with tools so it only makes sense that people want to understand how we came to where we are today. How did our lineage develop such advanced technology? Fortunately taphonomy has been kind to us, unlike many other instances, and stone preserves well leaving an archaeological record that is rich and vast. As such the story of the development of tools is one of the most well understood aspects of human evolution*. 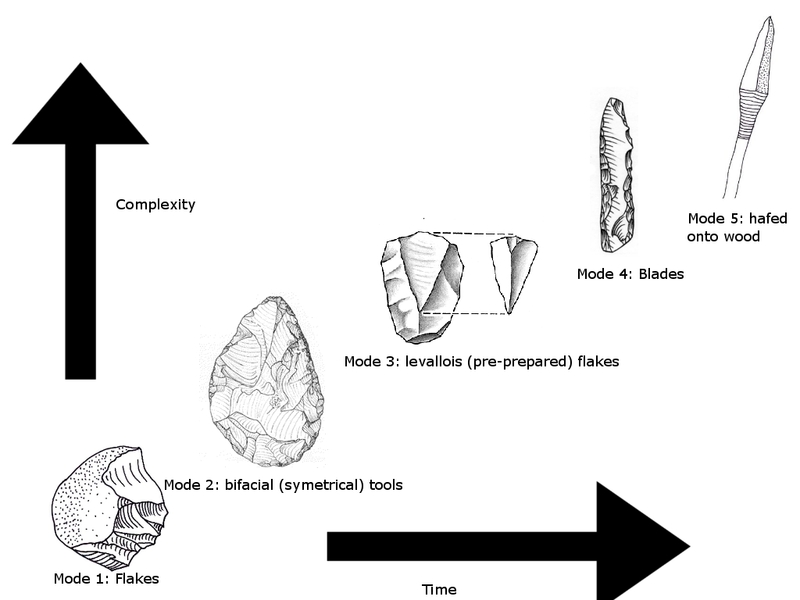 The traditional story of stone tools starts with the Oldowan, a simple technology consisting of sharp flakes chipped of a larger core by striking it with a hammer stone. First made ~2.6 million years ago – seemingly by an early member of the genus Homo – this industry marks the genesis of stone tools. However, finds from Ethiopia (the same country the earliest evidence for the Oldowan comes from) are threatening to overturn the traditional story of the start of the stone age: a scattering of fossil bones have been discovered that have apparently been cut by stone tools. Found on the surface, these bones had no sediment stuck to them which makes it hard to find out which sediment layer they come from (and thus how old they are). However , the discoverers note that there is a nearby sandy layer of soil and, since sand does not adhere to bone especially well, they may have come from there. Whilst the sandy layer itself cannot be directly dated it is sandwiched between volcanic tuff which can be dated via the argon-argon technique. These dates demonstrate that the sandy sediment (and the cut bones which may have been contained within them) was deposited between 3.42 and 3.24 million years ago. If these marks on the bone were made by tools and if the bones did indeed come from this sandy layer then this would push the age back for the first stone tools by nearly 1 million years (between 6-8 hundred thousand to be precise). On top of that, it would also mean that the first hominin to use stone tools was not an early member of our genus but actually an Australopithecine such as Australopithecus afarensis (the species to which the famous AL-288-1 specimen belongs) which has been found in the area. This would have remarkable implications for the intelligence of early hominins. 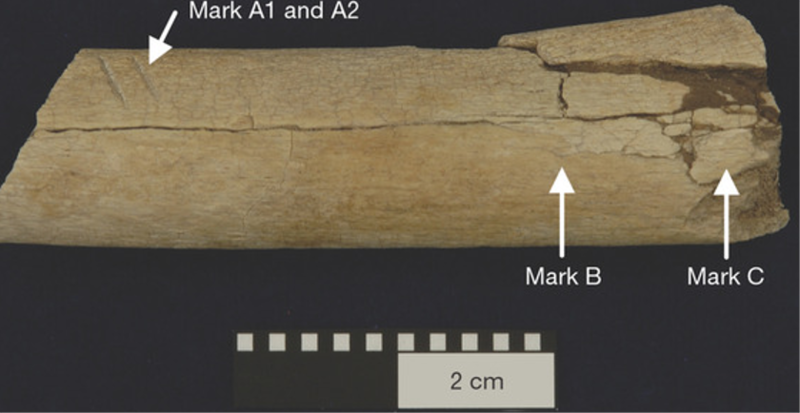 The other bone with alleged toolmarks on. However, the validity of this discovery – and all the interesting implications for Lucy’s tool making capacity – rest on some very big ifs. Needless to say a good chunk of the evolutionary anthropology community is far from convinced by these finds. For starters there’s the fact that these bones were not found in association with any sediment (or at least very little identifiable sediment). Since the fossils themselves cannot be directly dated we are reliant upon getting dates from the stratigraphy. Yet this gets a bit difficult if we don’t know which layer they came from. The lead authors try and suggest that since no sediment was found on the fossils it came from a nearby sandy layer since sand wouldn’t really stick to the fossils. At the end of the day however, there is no direct evidence that it did indeed come from this sandy sediment. Further, the 3.24-3.42 million year old sandy layer in which it is claimed these fossils originate from is highly abrasive and so might scratch bones within it. 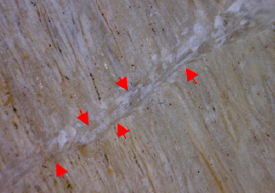 Indeed, experiments have revealed that such rough conditions can naturally produce marks on bone like these ones. Other fossils are also found without stratigraphic information and still accepted. Experts can be wrong. This is especially likely to be an issue given that the experiments show natural cuts can look very similar to the ones found on the fossils. Even fossils with less sediment data than is preferred still have more stratigraphic information than this. On balance then it would seem that there is insufficient evidence to push back the first use to tools based on these specimens. The cuts look very similar to “natural” ones and the absence of information on how old they are kind of renders the whole point moot anyway. Hopefully the next “revolutionary” discovery will truly be as important as is claimed. *And the fact there are so many unanswered questions regarding tool use should tip you off to the fact that human evolution still holds a lot more mysteries for us to uncover. April 17, 2012 in Australopithecus afarensis, Australopithecus garhi, Prehistory. Australopithecus sediba: human by accident? Did Australopithecus make stone tools? interesting article you have! I find a lot of arrow heads around my area I have also found carved rock but I thought nothing of it, I am going to have to inspect what I find a bit more! Remember, like I said in the post, most of the important information from a find comes from its context. So if you think you found something important try and leave it where it is or if that isn’t possible (sometimes you only realise its a good find when you have it in your hands) be sure to record where you found it in as much detail as possible. Here is an interesting article from a highly informative and top notch evolutionary anthropology website for those of you who like or are interested in science.